Times Ltd, a Shanghai-based hypermarket and supermarket operator, announced last night it had not entered into any agreement over a sale amid speculation over its future. The company said it will review all proposals and will then determine which, if any, of the proposals to take further. It made an application to resume trading in its shares this morning after it was halted for the second time yesterday. There is speculation Times is the target of an acquisition by Wumart Stores Inc or Lianhua Supermarket Holding Co.
Sun Ming, spokesman for Lianhua Supermarket, declined to comment, while Wu Jianzhong, chairman of Wumart, was not available to answer the phone. Times halted dealing on its stock on Tuesday, citing a "possible event involving the company", after the Wall Street Journal (WSJ) reported that controlling shareholder Kenneth Fang is selling the chain. Times Ltd's statement released late Tuesday said it had invited a restricted number of parties to make proposals in connection with the strategic review. It said the review was at a preliminary stage and, there was no assurance of any transaction. The WSJ reported that Fang and his family, owning a 72.29 percent of the retailer, could raise more than US$560 million through selling the company. The Hong Kong-listed retailer, with a market capitalization of around HKUS$3.7 billion, owns 52 hypermarkets and 14 supermarkets mainly located in second- and third-tier cities in Jiangsu province as well as Shanghai, Zhejiang, Shandong and Anhui. 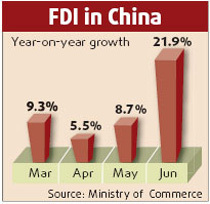 Its net profit rose 62 percent to 137 million yuan in 2008 with 4 billion yuan in sales. 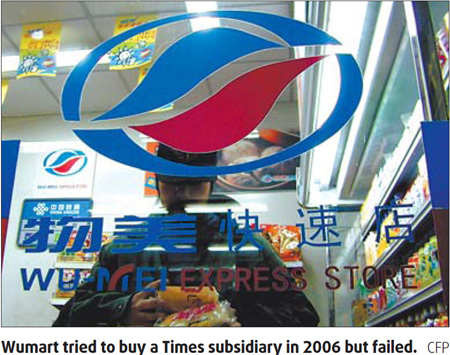 Alex Liu, retail analyst with market research firm Euromonitor International, said: "Wumart, whose 400 stores are located in northern China, tried to buy a 50 percent stake in Jiangsu Times Supermarket Co, a subsidiary of Times, in 2006, but failed. If it could successfully purchase Times, its competitiveness in eastern China would be greatly improved and it could help accelerate its expansion nationwide." Wumart, the fourth-largest supermarket chain by sales, said on Aug 12 that it would cumulatively raise about HKUS$1.65 billion from strategic investors, including a TPG-managed fund, and use the money to open new stores and make acquisitions. Liu said Chinese retail markets in first-tier cities tend to be saturated. Many international retailers, including Wal-Mart and Carrefour, have speeded up their development in the second- and third-tier cities. He said relatively small-scale regional retailers would find it difficult to compete with these retail giants in terms of cost and management experience, forcing them to close or be taken over. - Critics give thumbs-up to "One Night in a Supermarket"